While hanging out on Pinterest the other day, I got a bit of inspiration. Everyone seems to be using their crock pots to make these amazing things – even lasagna. So I had to try it. I love lasagna and make it often. I like to mix up the ingredients to keep it fun, like using cubed and roasted chicken with a cream sauce or ground turkey with thin strips of butternut squash. I figured for my crock pot lasagna experiment I’d keep things pretty basic – you know, the good stuff. Italian sausage, a big jar of sauce, and lots and lots of cheese. This is really easy, and you can’t mess it up. All you need is a box of no-need-to-boil lasagna noodles, a large jar of your favorite pasta sauce, about 1/2 lbs of italian sausage browned, and 2 cups shredded mozzarella cheese. Go ahead and gather whatever else you like in your lasagna. I always toss in some fresh spinach – and I happened to have some of my fresh homemade ricotta in the fridge. Now get your crock pot cranking on high heat and coat the bottom with a good layer of sauce. I added about 1/4 cup of water to the crock pot, too. This way the bottom of your lasagna won’t get burnt. Cover that sauce with a few of your lasagna noodles. You can break them up to fit in the crock pot. Sprinkle on a bit of the sausage, and any other ingredients you like, such as chopped mushrooms, olives, spinach, along with a sprinkling of shredded mozzarella. Pour on a bit more sauce and then repeat. Yup, that’s right. Repeat and then repeat, and repeat again. Leave about 1/2 cup of that shredded mozzarella for later. I kept layering until my sauce and sausage were gone and then called it quits. I gave the top a final coating of sauce, along with 1/2 cup of water, and then put the lid on the crock pot and left it to do its thing for about 4 hours. About a half hour before eating, I dotted the top of the lasagna with 1/2 cup of my fresh ricotta and that leftover 1/2 cup of shredded mozzarella. 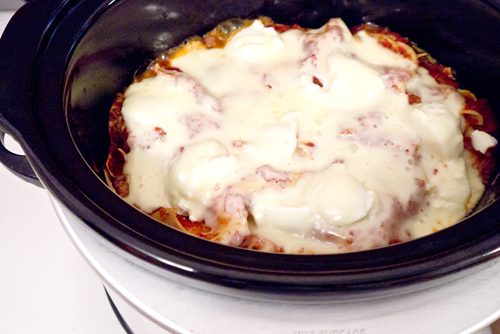 I put the lid on tight and within minutes, my crock pot lasagna was ready to serve. yum! never thought of lasgna in the crock pot!! I am definitely going to try it. pretty cool. except i don’t see how crockpot lasagna is any different from oven lasagna. I’ve been looking for a good crockpot Lasagna recipe. Thank you! I will be sharing with my colegues. did you only put the ricotta on at the top? not in the layers? I only put the ricotta on the top but you can use it in the layers too, which would be really good! I think I only had enough for topping my lasagna when I made this…. Do you cook on HIGH OR LOW? Sounds yummy!!! Never mind!!! Looked over it 🙂 Sorry!!! If I put everything together in the crock pot the night before and refrigerated it until morning do you think it would still work out as well? Maybe add an hour to the cooking time? Hey, Kitra! You could put all the ingredients together the night before, but I’m thinking the noodles might get a bit soggy. But, you can totally try it! If you do, let us know how things turn out. The overnight prep worked great! I put everything in the crock per your instructions and put the lid on and stuck the whole liner in the fridge. Then at 2pm the day I pulled it out, cranked the temp up to high, and let it cook. I added the ricotta at the end just like you did (and some more mozzarella 🙂 ) and we had an amazing dinner at 6:30pm. The noodles were perfect and it didn’t dry out, which is what worried me the most! Thanks for sharing your awesomeness!